How's that for a catchy title?! Mondays have always been hard for me, but are even harder when it's cold and gray and rainy. It truly makes me want to hibernate. So here I am trying to be alert and trying to write a post at the same time - not sure what will happen - LOL! First of all, I should say Happy President's Day to all! Many of you are enjoying a holiday today - have a great one! My son is home today - no school - but he is currently amusing himself with Wii Fit. And perhaps if he does it enough, I will get some of the benefits through osmosis. Go, son, go!! Do you need help getting going on a Monday? I can suggest a couple of places to start. 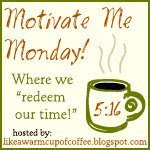 Stop by Like a Warm Cup of Coffee for Motivate Me Monday. I'll be stopping by there later to get motivation from some ladies who are trying to spend more time with the Lord. Stop by Organizing Junkie for Menu Plan Monday. I could use some new meal ideas and if I get my menu set for the week now - I'll feel like I'm starting off on the right foot. "Work fascinates me" - I could look at it for hours. From Steven Wright: The sooner you fall behind, the more time you'll have to catch up. That's it from me today because, after all, It Is Monday. I hope to be back on track and caught up by tomorrow! These are great places to start! Heading over to check these sites out! Did you guys get any snow last Friday? We did! Ahhh! I almost missed this opportunity to comment my friend. It is Monday and I'm tired. We had a nice time at the B & B. I'll probably do a post about that tomorrow. I love the last one...The sooner you fall behind the more time you'll have to catch up. I think that one applies to me :o) Thanks for sharing! And I took care of my meals for the week. I went to Honeybaked Ham today and got a small ham. It will be great for us to munch on all week. Yummy! Take care my friend! Hope the rain stops soon!